There are many advantages and disadvantages to switching to from Windows to a Linux operating system like Kubuntu. One the one hand you have to be willing to jump in and figure out how to use the command line, install strange and incomprehensible packages, Google stranger error messages in an effort to solve them, and more. One the other, this same problem of having all the innards of your computer easily poked and proded at means you can customize every nook and cranny of it. Most people know controls like CTRL-C, CTRL-V, CTRL-ALT-DEL, etc. Maybe even ALT-TAB and CTRL-BACKSPACE. Those are good things. But what if I wanted “paste” to be CTRL-P instead? Sure it would confuse anybody else who used my computer, but on Kubuntu it can done. 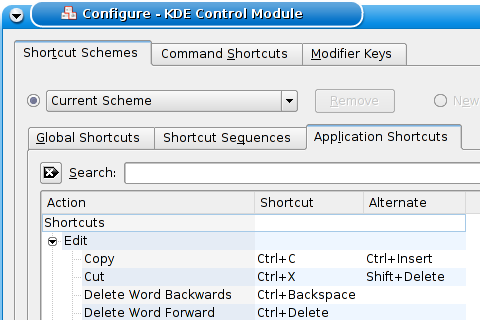 You can change every built in keyboard shortcut, and create your own to do other things. “Paste” is still CTRL-V, but now I can open Firefox with CTRL-SHIFT-F, I can open a dictionary with CTRL-SHIFT-D, and I can stop, play, change tracks, and more in my iTunes clone (Amarok) using my WINDOW key, no matter what other program I’m using at the same time. Finally, I’m getting some use out of my WINDOW key! What can I say, I’m just a big geek for keyboard shortcuts. I really should get around to trying Amarok, thanks for the reminder. I use Ubuntu because I generally prefer Gnome over KDE, but sometimes KDE apps are just better. I’ve never used Gnome, mostly because once I heard Gnome was more like Mac OS I lost all desire to try it. Mac and I don’t get along.